Mitsubishi has been out of the pickup market for years, but the midsize Raider changes that. 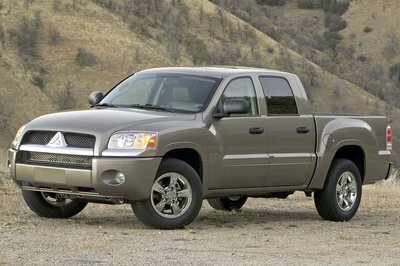 The Raider has fresh new styling that distinguishes it from its Dodge Dakota sibling. A V-6 engine powers Raider, which is available in extended cab and double cab models. The hydroformed frame is fully boxed for increased strength. 4WD models are upgraded with off-road tires, high pressure gas dampers, increased ride height, skid plates, and a limited-slip differential.